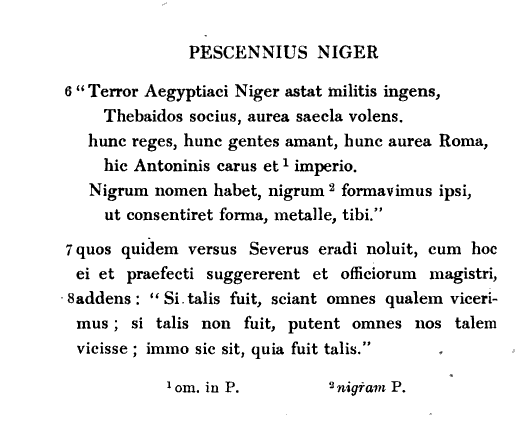 Pescennius Niger was descended from a family that originally belonged to Aquinum (now Aquino). His parents, Annius Fuscus and Lampridia were middle class. After holding various military commands, he was made Consul by Commodus, and at length was appointed commander of the Syrian army. Emperor of Rome (193-194). He was a native of central Italy, from an elite Muurish Roman family. Yes he was a Muur, black as the night, and magnificent. During the reigns of Marcus Aurelius and Commodus he had kept the Germans from invading Roman territory. In 192 he suppressed an insurgency sponsored by the Jews and Saracens. He was among the high generals of the praetorian guards who plotted the take over of the empire after the death Roman Emperors Commodus and Pertinax. After the death of Pertinax the prætorian guards proclaimed Didius Julianus emperor; then shortly after,the troops in Britain rebelled and elected Clodius Albinus; those on the Danube chose Lucius Septimius Severus; and the soldiers in Syria elected the governor of that province, Caius Pescennius Niger Justus. Septimius Severus advanced to Rome with the Pannonian legions. Julianus was killed, and the senate acknowledged Severus. Severus now made Albinus a co-emperor. Having bought off Albinus for the moment, Severus then addressed himself against Pescennius Niger. Emperor Niger had many sympathizers and adherents at Rome making him very dangerous to Severus’ plan. Moreover, Antioch, where the proclamation of the rival emperor had been issued, aspired to the same position as Rome. Pescennius Niger rallied the support of the petty Oriental rulers. He quickly prepared for war with Severus. He appointed the able proconsul of the Province of Asia, Asellius Æmilianus, as his chief of staff. The ports of Asia were closed; the passes over the Taurus mountains were fortified; and Byzantium was garrisoned. Severus also had made far-reaching preparations. Troops were sent to Africa and the seasoned army of the Danube was brought together. The war had assumed an international dimension. When the advance guards of the opposing armies met at Perinthus, the capital of Thrace, Niger’s army beat back the soldiers of Severus. Severus, however, was undeterred and proceeded with his main army across the Bosporus and by way of Candeto near Cyzicus. Here in 194 a battle took place in which Æmilianus was slain. Niger hurried to the scene with his army to provide back up but was defeated near Nicæa, with the result that most of the cities of the Province of Asia came into the hands of Severus. Niger then fled to reach Antioch, to prepare his final stand. Pescennius Niger lost Antioch when he was defeated in a battle fought south of Issus. He sought a retreat among the the Parthians, but he was overtaken and killed towards the end of 194. Pescennius Niger Denarius. Antioch mint. IMP CAES C PESC NIGEWR IVS AVG COS II, laureate head right / BONAE SPEI, Spes standing left, holding flower & lifting hem of skirt. RSC 4.